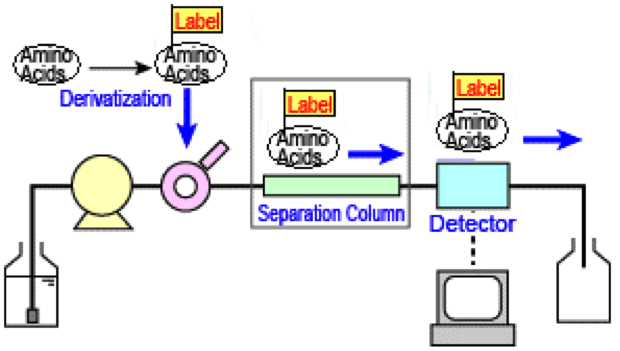 Amino acid composition analysis is a classical protein analysis method. It can be used to determine the composition and content of amino acids in protein/peptide, and non-typical amino acids in protein/peptide drugs. Analysis of amino acids is a necessary step before the complete sequencing of biopharmaceuticals, and provides valuable evidence for the analysis of the sequence of biopharmaceuticals. Based on amino acid derivative technology and high-efficiency liquid chromatography, MtoZ Biolabs provides efficient and accurate amino acid composition analysis service for biopharmaceutical products. The service mainly consists of two steps：1. Hydrolysis of proteins and peptide samples into free amino acids; 2. The derivation and detection of free amino acids. MtoZ Biolabs uses phenyl isothiocyanate (PITC) for amino acid derivation, followed by a high-efficiency liquid chromatography for determining the composition and content of amino acid derivatives, so as to speculate the components of the amino acids in the protein/peptide samples. Protein sample should be dissolved in distilled water or PBS. Sample quantity: we recommend you to provide 30ug total samples and aliquote the sample in 3 tubes.